Dry eye syndrome is known as the decreased tear secretion resulting in various vexing conditions. The curent treatment is the recurrent use of artificial tear solutions. However tear film consists of three different layers, mucin, aqueous, and lipid, artificial tear slutions only help cover the decreased aqueous layer. In the treatment of dry eye syndrome, the other two layers are also expected to be eked out. The mucin layer plays a important role to lubricate the ocular surface anchoring the aqueous layer to the cornea. Without sufficient mucin layer, the tear evaporation from ocular surface cannot be prevented however recurrently artificial tear solutions might be used. In addition, the mucin layer froms the surface bufler to cornea, and the decreased mucin layer might cause corneal bacterial infection. 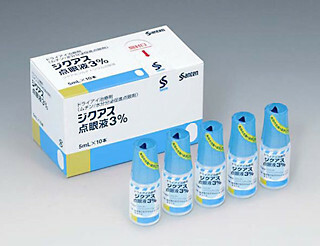 Diquas TM, newly developed by Santen Pharmaceutical Co.Ltd is the first eye solution in the world to stimulate mucin secretion, so the combined use of Diquas TM and artifical tear solutions will show the high potentials in the treatment of dry eye syndrome.